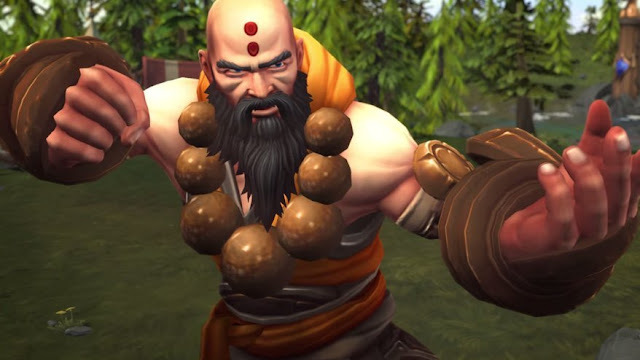 In Heroes of the Storm, Kharazim is a devout and disciplined battle monk from Blizzard's action RPG Diablo 3. Therefore Kharazim makes both as a damage dealer as well as supporting a good healer figure. Kharazim comes from the distant Ivgorod where Thousand and One God worship, living and acting according to the monks of this country in all things. Therefore the monks of Ivgorod are very wise and disciplined, which is reflected mainly in their mystical martial arts. The monk is a master of his order and can use the power of his Spirit both for heal and destroy. Kharazim has a very interesting passive skill called transcendence. We heal with any third auto-attack the weakest nearby allies. Since Kharazim likes close range and will disappear quickly from the fight, he has a skill called Glimmering rush with which he jumps to an enemy or friend. Breath of Heaven, however, is your main healing spell and with lethal reach you raise your melee distance. With ultimate skill for healers variant called God's hands. Thus you prevent an ally dies within the next three seconds! Mobile Very - Ultimate skill difficult to time. With the build here you created one Kharazim, the opponent thrashes through the botany, while left and right skin healing. But keep in mind that you need a good timing for your Ultimate skill. But then you can a lot of fun in your party spread. Leoric is known to every Diablo fan, because the undead king of the skeletons was one of the intermediate bosses on the way to Upper Rogue Diablo. For once he was a just and brave ruler, but Leoric was Diablo’s influence paranoid and cruel and even after his death, he finds no rest. Leoric has a unique special ability called immortal, which makes him truly immortal. Whenever it gets you, Leoric haunts around as a ghost and can continue to use skills. These do no harm, but cure him by half of the theoretical damage. Once his life bar is full, Leoric arises in place again and can continue to fight. Furthermore, with his thick lobe hordes of servants and to the ability of souls he can quickly change position, because of the Skeleton King is slow! The necessary healing ensures undertow of despair because Leoric as Health robbed by the enemy. His ultimate, march of the dark king, is aimed at high damage and sweeping away everything before Leoric. Here you done a terrible with this build, the spread with his club fear and terror, as he marched through the ranks of the enemy and thereby nourishes the life of the opponent. 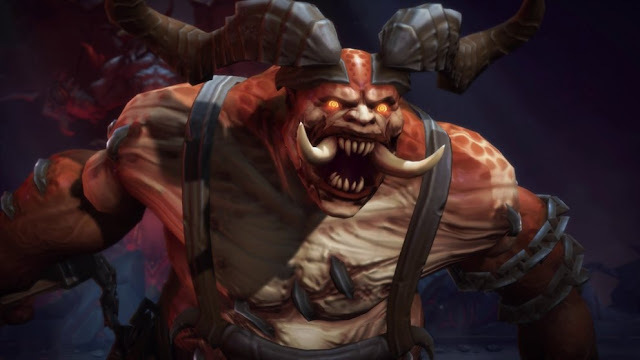 In Heroes of the Storm the butcher is a cruel butcher demon from Blizzard's action RPG Diablo. In Blizzard's Moba you play the butcher as brutal Assassin who strengthens himself with fresh meat. He was the first interim boss, who with his cleaver lunged with his battle cry "Ah, fresh meat!" On the heroes. And since the butcher is known as Diablo-villain, he also exists as a hard hitting Assassin fighter in Heroes of the Storm. Heroes of the Storm: The Butcher - Ah, fresh meat! The butcher, it's all about one thing, fresh meat! Because his passive skill with which he collects for each dead enemy flesh. Each chunk of fresh meat donates 1 percent more damage. Up to 25 percent, which improves the Butcher's massive car attacks! And with numerous talents, the carnality grants even more bonuses! But beware that you do not become a mess yourself, because then you will lose your valuable flesh with bonuses. Furthermore, the butcher prevents his victims by Mutilate on running away and if he is too far away, he jumps just with brute rush into the fray. And so he will not prematurely tip out of the pines, the butcher can cure at the expense of his opponents by branding. His ultimate ability is called "Fresh Meat" and nailed an enemy hero firmly so the butcher can dismantle him alone. Very high damage through automatic attacks with fresh meat - Loses his flesh bonuses at the death. With this range of skills you get a butcher, the inferior his example in Diablo in nothing and chopped his enemies to bloody chunks of meat. But make sure that despite all the joy of hacking and Mangle not goes on it, because otherwise you have your meat stock quite increase from the front and loses a lot of potential DPS.